Tip: If you cannot find The Garlic Box brand of Diced Garlic Scapes in brine, replace with capers or Garlic Scape Relish or a standard chopped pickle will do. 1) Lay a piece of foil on a baking tray and slightly grease foil. 2) Thinly slice the lemon and place on foil. 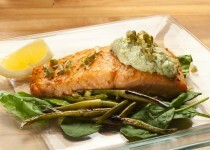 Put salmon on top and lightly coat with oil or butter before seasoning with salt. Place remaining lemon on salmon. 3) Bake 10 min/lb and let stand a few minutes before cutting. 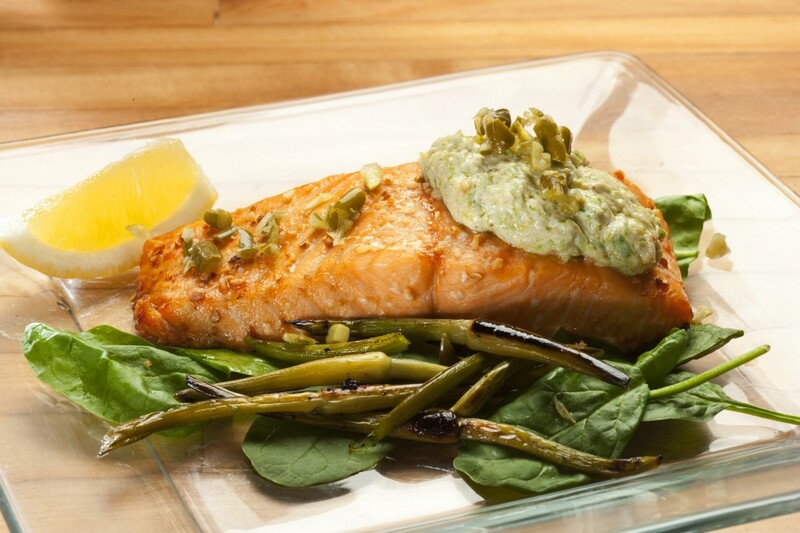 If serving your fish cold, remove from cooking tray and wrap in foil for 2-3 hrs. Garlic Scape Tartar Sauce - Mix all ingredients together well, seasoning to taste. Let sit to marry flavours. Keep refrigerated.